Da Cheng Quan (Great Achievement Boxing) like Tai Ji, Ba Gua and Xing Yi is part of the Chinese Internal Martial Art family. This art was developed by renowned Master Wang Xiangzhai in the 1920’s and first taught under the name. Yi Quan, pronounced “Ee Chuan” (Will or Mind Intent Boxing) in Shanghai. Wang Xiangzhai was born in Shenxian county, Hebei province on 29th October 1890. When still a boy, he practised Xing Yi Quan under one of its greatest masters, Guo Yunshen, who taught him a great deal before he died. Thereafter, Wang dedicated himself to learning martial arts and travelled China seeking out masters, including a visit of several months to the Shaolin Monastry in Henan. 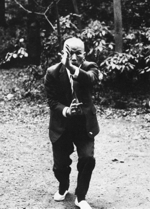 The results of his studies, was the development of his own unique style, developed to stress the importance of the “Will” and to “re-establish the original sense and quality of Xing Yi Quan”. 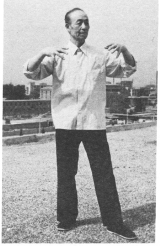 Yao Sung Shun - now deceased having taught several students, including senior student Xue Si Qi, resident in Beijing. Kenichi Sawai - A Japanese subject who lived in China for 12 years in the 1930’s and 1940’s, returned to Tokyo and taught an ammended version of the style, named in Japanese “Taiki Ken”. Mr Sawai died in the early 1990’s. Wang Xuanjie - now deceased, having written books and publicised his style. Li Yu Yuan - also living in Beijing, now 75 years of age. The essence of Da Cheng Quan is to break away from rigid structures imposed in the other internal arts, always, of course, adhering to essential concepts of posture, ie “connecting and rooting the body”. The belief is that no form is the strongest form. The effect of training is to produce a strong, lively independent and individual mind, free from petty prejudice, capable of deep insight into humanity, along with a strong and healthy body. Needless to say, very powerful Martial Art skills, for defense or attack are also produced which tend to become stronger with age and practice.